Memorial day set off barbecue season, and we’re only three weeks away from the official start of the summer. What’s on your summer menu? If you plan on cooking your own meals, you’re in luck, because cooking for yourself comes with many benefits, one of them is having control on what you put in your body, as well as being able to modify certain recipes to your tastes. This can be done by choosing low-fat products, cooking on the grill, and avoiding high-sodium sauces, condiments, and dressings. Let’s run down four popular summer foods and see how you can modify them and make them healthy. OK, you’re probably wondering which type of rib meat. While there is some debate about the level of “healthy” in pork or beef, pork would be a better choice because a typical serving of a lean cut of pork tends to be lower in fat compared to beef. But if you’re not fond of pork and all the health concerns that surrounds consumption of this meat, then choose beef. Make sure you’re choosing a lean cut. If lean beef is not available at your supermarket, have a butcher cut it for you, or do it yourself when preparing—just trim all the fat. Same for poultry. Whether you like turkey or chicken, both are leaner choices compared to pork or beef, but chicken legs and thighs contain just as much fat as red meat. Choose lean cuts of poultry like breasts and wings to grill. Another thing to watch out about barbecuing meats, is the sauce. Most barbecue sauces have high fructose corn syrup, sugar, sodium and bad fats. Low-fat or fat-free versions of barbecue sauces can be found in supermarkets, but you can always make your own. Check out these healthy homemade barbecue sauces that you can make yourself. There are even barbecue sauces that are calorie free; Walden farms has a variety of these. For an even better health option, omit all sauce completely. And the good part is, if you’re not fond of taste of light mayo (they do vary depending on brand), you can cut it out completely and substitute with mustard or greek yogurt—they are much healthier alternatives. See more. What’s summertime without burgers and dogs? The good thing about burgers is that they come in many types, so you have many options. If you do make your own, pick a leaner meat. While lean beef is available pretty much everywhere, why not consume less fat by choosing ground turkey or chicken? Or try veggie burgers for a less fattening option overall. There are countless turkey and chicken burger recipes to choose from if you’re preparing your own. If you do, add fresh ingredients like onions and chopped parsley or garlic for more nutrients and vitamins. Add spices as well, particularly spicy ones like black and cayenne pepper, as they help boost your metabolism to help you burn fat. To further reduce fat intake, try not to add common condiments like ketchup and mayo to your burger. Avoid cheese if you can too. If you must use cheese, instead of American cheese which is commonly eaten with burgers and is also heavily processed, go for cheddar or swiss cheese—swiss cheese is an especially healthy alternative, and it’s the only cheese that provides the highest content of vitamin B12. For hot dogs, since most are already processed, there’s no doubt you will be consuming meat high in sodium. But you do have options. Avoid combination hot dog meats that are made with chicken, pork, and beef. Stick with franks made of poultry, and look at the fat content on the labels. It’s recommended to choose one that is under 3 grams of saturated fat. If you have no problem going meatless, why not try veggie dogs? Veggie dogs are even lower in fat making them the healthiest type of hot dog. Just like burgers, avoid the most commonly used condiments. Good alternatives to ketchup and mustard are salsa and cottage cheese. When it comes to buns for both burgers and dogs, white bread should be avoided. Even though whole-wheat breads tends to have more fat, it provides healthy fats like polyunsaturated and monounsaturated fat. Whole-wheat bread also has less sugar and a good chunk of fiber, making it a better option. If you’re not grilling these this summer, you should. You can make kabobs however you want and they’re generally healthy. The healthiest kabobs you can make are with chicken, vegetables, or fruits. Since most of the fat you would normally get from kabobs would come from the meat, you can avoid the chicken and meat altogether, and substitute it with tofu or fish. Combining them with vegetables like bell peppers, onions, mushrooms, and tomatoes is even better and tastier. See this tilapia kabob recipe. Kabobs are usually eaten with rice, and it’s best to eat it with brown rice. The best changes you can make for low-fat cooking this summer is taking advantage of your grill, particularly an outdoor one, but indoor grills are fine too. Between baking, grilling and frying, grilling is the best cooking method for warm weather as well as it being an overall healthy cooking method. Fried foods, no matter what oil you cook them in, are high in fat and calories, especially deep frying. Baking is healthy and cooks evenly, but depending on what you cook it may take longer, and if it’s 90 degrees or above outside, do you really want your house being hot from the oven? Most grilling is done outdoors, it allows fat to drip from meats, making grilled foods reduced in fat content, and unlike frying and baking, oil is hardly needed for grilling. The direct heat from fire grills cooks meats faster. 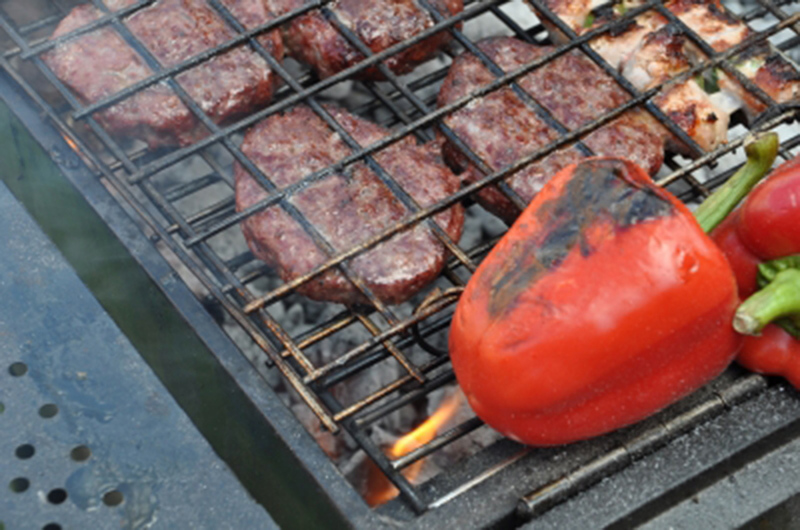 Grilling also provides a taste you won’t get from frying or baking. Hope you enjoyed reading various ways to switch up and make your summer cooking low-fat and much healthier. How will you cook low-fat this summer?